The paw tracks were always recognizable. They belonged to Slewfoot. This bear had been hunted for years because of his supposed trophy size, plus his claws and pelt. Long ago he had been caught in a trap which severely damaged a front paw as he twisted his way free. This made his personal, crooked, track easy to recognize. Hence the name Slewfoot, for his sliding gait. It was estimated by the local game warden that this black bear could weigh 600 pounds or more. Attempts to catch him included baiting him with raw meat. A bear is a vegetarian, but can be tempted to become a carnivore if fed a meat diet. This also makes him more dangerous to livestock … and us humans. I was never inclined to hunt him until the day my son, David and I came upon his tracks in Mooney Canyon. Mooney Canyon meandered for near thirty miles off the Mogollan Rim, south of Flagstaff, Arizona down into the Verde Valley. There the name changed to Spring Creek where its erupting springs flowed into a river called Oak Creek. Mooney’s upper portions are steep and difficult to access. On its west side, in those lofty upper reaches was the Mooney Trail. A two mile, winding path that took our cattle to summer grass. The climb from 3,500 to 6,500 feet was treacherous to say the least. We seldom saw the narrow upper canyon once we started up the trail except from the heights above. Our cattle never strayed too far up into its waterless boulder strewn depths. 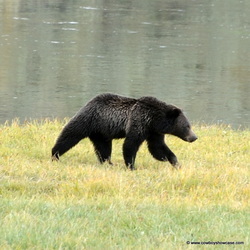 Bears usually stayed at higher elevations above 4,000 feet. On this occasion my twelve-year-old son and I were searching for some steers that may be grazing up at the start of that trail. Son, David, was young but already a good hand with a horse. A fine cowboy saddle-pard even then. No water holes were known up there so why these steers kept making tracks far up into this canyon was a mystery. It was time to bring them back to a better grazing area. Our curiosity got the best of us and soon we were scouting a mile or so up this uncharted draw. During some spring thaws this canyon rushes snow melt down thru its course in a raging flash flood. I have seen these floods carry juniper, and pine trees, even car sized boulders, in its currents. Not a safe place to be in early spring, but okay now in late April. The further we went the less tracks we saw. We began to think cattle had better ideas on where to get a drink … We were soon to savvy differently, as our horses now became a little skittish. It was then I saw the tell-tale track of Slewfoot on the soft spots of earth that weren’t rocky. In thirty minutes the scent in the air was fresh with the pungent odor of bear. Slewfoot was a large bear, maybe only a month out of hibernation, still with much early hunger. I was glad to be packing my pistol in a chap pocket. Our horses were now still willing, but nervously cautious. Our dog became more interested in sniffing the ground, but I kept him behind us. What was left of a trail was only a narrow rocky canyon that we continually climbed in and out of up along its banks. Then down back into it to traverse another thirty yards. Then climb out again because of the dry waterfall type blockades that prevented the upward passage. The steep climbs in and out were getting tough even for these cowhorses accustomed to rough trails. Our mounts seemed to be peeking behind every bush and tree because of the stench of the bear. The closeness of trees and brush in these narrow canyon confines only added to the impact of the smell. We could see clumps of black hair on tree trunks where he scratched his matted hide. The tree trunks reflected where he cleaned and sharpened his long black claws. It appeared he had been living near here for a long, long time. We were about to give up this perilous search for many reasons. Our horses were announcing their concern and wariness by sounding out with rollers in their nose. That is, exhaling with rumbling snorts thru their nostrils with jaws tightly shut in readiness for fight or flight. Now, also, was the smell of dead carrion in the air. David was still as curious as I, so we kept going. The trail was getting very narrow as we approached our last attempt at crossing the ravine. I felt uneasy because even though I didn’t mind surprising a bear, I did not want a bear to surprise us! A bear can run as fast as a horse for about thirty or forty feet. His four legs are the most powerful parts of his body. Closely competing in strength are his jaws. He alone has coined the phrase Bear Hug. He can hug a fat ponderosa pine tree and use these powerful four limbs to rapidly hunch upwards in successive hugs to claw his way to remarkable heights. I’ve seen them climb to over 70 feet up, then walk out, balancing easily on the first limb, to watch me below. Muscular legs give them the power to quickly standup straight and deliver a killing swat with a clawed front paw. Killing or maiming a hunting dog for life. You do not want to corner a bear like this. Our last careful approach into this pit like wash was a wary one. My son, behind me, could not see what I scanned ahead, as my horse took careful steps down the trail into our last large pothole. It was a gruesome revelation. Scattered about this small circumference was the remains of at least seven carcasses. Most only skeletons, some in different stages of decimation. This small circle of space was a killing field. We did not intend to stay long in this trapped, stench air, but I had to unravel this mystery. It was easy to spot a little waterhole below the dry waterfall area that blocked any upward climb. A strangely shaped drinking spot. I rode up closer to the putrid remains of what was left of a unique drinking place lasting weeks after a good rain. It was also a nature made death trap. We had our thirsty dog with us all day and he happily jumped into what was left of the water. Only a foot or so, down in a funnel like bowl of red rock, shaped smooth by eons of time. The top of this funnel was near eight foot in diameter. Its depth when full was probably seven feet. Greenish slimy sides completed the trap. Our dog solved the mystery for us. He could not extract himself from his chosen canteen. Try as he could the rock was too slick to climb. Not a notch, crack, or rim for a grip. I dismounted to drag him out. Reaching way down I grabbed him up by a flailing foreleg. We slowly envisioned the scene in its proper context. Animals needing a drink kept coming here and drinking as the water daily receded. The steepness of the funnel, plus the frightening approach of a lurking bear thus caused any one of them to slip into the waterhole. Never again to be able to climb the slippery sides to safety. Either drowned in exhaustion, or mauled to death by the bear, they eventually all became meals for this sly killer. I saw bodies and bones of the three steers who made those fading tracks. Along with them there were, what was left of, about four or five deer, and some small animals, too. We looked at each other questioningly, realizing we were plumb in the middle of a bear's dinner plate. In agreement we gave up our search for steers and bears, climbed out of that graveyard and rode home. We were fortunate it was not the time for the bear to check his buffet. Slewfoot remained a legend in this area and likely died of old age. He had no predators but man. Nobody ever bragged of getting him. I’m sure idle hunts were few after I told my story around. The pistol I carried was a .22 long caliber magnum. Small for bears you may say, but when younger I killed a black bear with three shots from it. I was then twenty five years old. It is said, a skinned out bear, lying on the ground resembles a human. It’s mournfully true! Slowly, as time has passed, I have regretted this more and more. Now I only hunt if desperate to eat.